Tapioca in a canning jar. Is that hipster or just old-fashioned? Dear readers, prepare yourself for a shocking truth: I have never tasted tapioca. Not so shocking, you say? Maybe you’re right. But I love to try new things, and tapioca isn’t exactly post-modern molecular gastronomy, so I think it’s kind of surprising that I’ve never tasted it. I associate tapioca with school lunches and books. A bit unusual, considering that there was no cafeteria in my grade school, and my high school never made the dish. In fact, the only place I’ve ever encountered tapioca was in the schoolroom lunches of the young adult books I read as a pre-teen, which were read more decades ago than I might care to disclose. In fact, one line of a book has stuck with me all of my life: “the tapioca of the mind.” I thought it was a very evocative line. I imagined things surfacing and disappearing in a viscous tapioca memory. All these things make it sound delicious, yes? No? Surely you jest! So I wasn’t particularly enthused to realize that one of the recipes that my on-line bake-a-long group was making this week from Dorie Greenspan’s Baking Chez Moi cookbook. Dorie’s recipe calls for pearl tapioca, which, when hydrated, resemble the bubbles in bubble tea. I had trouble finding pearl tapioca. I searched in 4 stores before I could even find regular old tapioca, which is what I finally ended up using. Too bad for this dish that I couldn’t find pearl tapioca. The pearls of tapioca would have made the dish very bubble tea like, and been classy and modern. Regular tapioca makes it a tad old school, and not in a cool vintage kind of way. Soaked tapioca. Kind of flavourless. Would be better in pearl form! That said…the addition of coconut milk to this dish makes it sooooo yummy! It’s definitely not your mother’s schoolroom tapioca! Dorie says that the combination of coconut and tapioca (from the cassava plant root) proves the adage that “what grows together, goes together”. 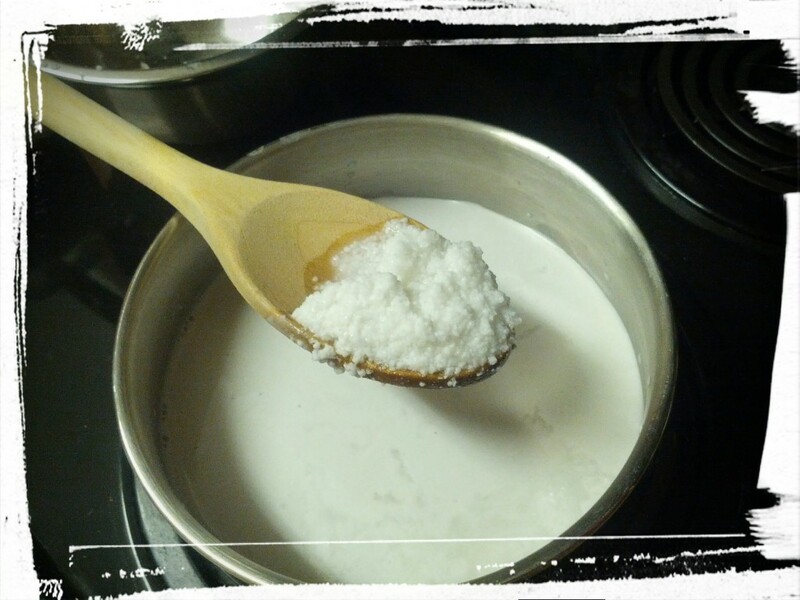 Basically, you’re cooking the tapioca in coconut milk (and one or two other things), so it has a very rich and authentic coconut flavour. Dorie suggests serving it with her recipe for Slow-Roasted Spiced Pineapple, but I’ve been fighting a migraine for several days and just don’t have the energy to make the dish, so I whipped up some caramelized bananas to top the tapioca with. Hey, what grows together, goes together, right? And do they ever! Am sitting at my desk, with a parfait glass of the coconut tapioca topped with caramelized bananas beside me, and am typing this post rather disjointedly, because I keep stopping to eat another bite. 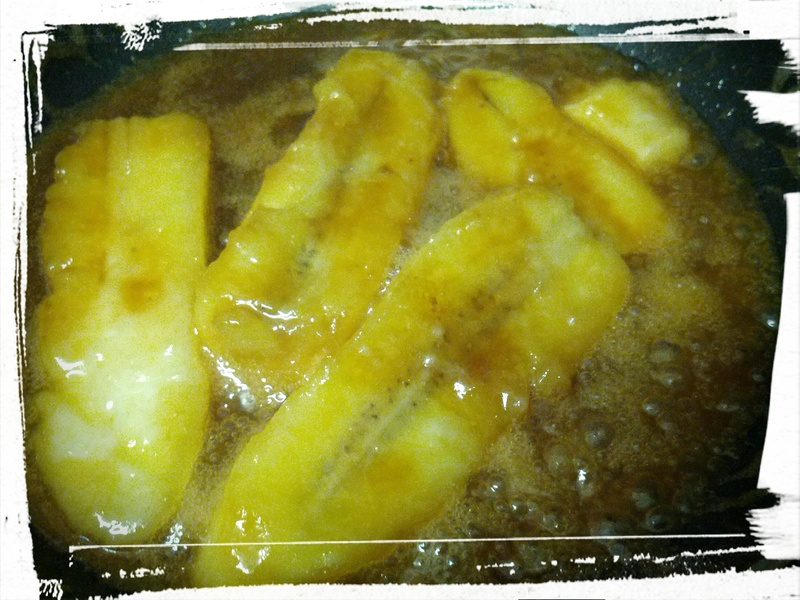 Is sooo good with the caramelized bananas! Never made caramelized bananas? Is so easy. Good enough to eat alone! Melt butter in a pan. Fry the banana until soft. Stir in 3 tbsp. cream (actually, I just poured in the equivalent of coconut milk — Queen of Substitutions, that’s me!). Stir in brown sugar. Cook over medium heat until bananas are soft and the sauce is all caramel-ly. And…done! 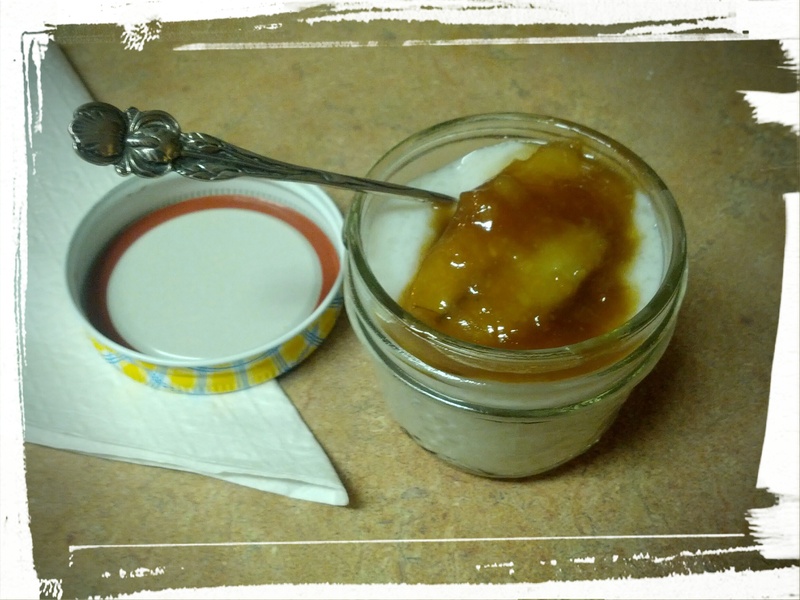 I set aside some of the caramelized-banana-topped coconut tapioca for the DH and I for lunch tomorrow, and for the DH to eat for dessert tonight. But if he doesn’t get home soon, I’m going to have his helping too. Proving another old adage: you snooze, you lose! Next Post: Lemon Meringue Tartlets. Really. Because they’re easy. Unless you’re fighting a migraine and then they’re just easy to eat. Pass the tartlets! This entry was posted in Cook-a-Longs R Us, Desserts Not Otherwise Categorized on April 29, 2015 by Margaret. Low in fat, high in flavour and crunch! A few weeks ago, I made zucchini coins for dinner. I had some sliced zucchini in the fridge, leftover from when I made my Four-Layer White Lasagna with Oven-Roasted Vegetables. Incidentally, that’s how I make a lot of kitchen decisions: what’s in the fridge? What will go bad if I don’t use it soon? Think of them as healthy fries, but low-fat and with nutrition. Definitely tasty, and healthy too — this is how to eat your fries and still feel energized after! Slice zucchini into rounds. Beat egg in a bowl and set aside. Mix breadcrumbs and spices in another bowl. Dip each piece of zucchini into the beaten egg, and then into the breadcrumb mixture. Place on a cookie tray. Bake at 350 degrees for 15 minutes and then flip over and bake until golden on both sides. Serve warm with ketchup and enjoy! Pro-Tip: Make these super-duper low-fat by only using egg whites. Seriously low-fat, while not losing any of the taste. Next Post: Lemon Meringue Tartlets, baby! Easier than you think. Post-Pub Edit: A modern version of the Que Sera Sera question: “Will I ever go viral?” I’m doing my bit by joining in a recipe link-up, up at Christy Jordan’s site over here. I do love that site! This entry was posted in Vegetarian Side Dishes, Waste Not Want Not on April 26, 2015 by Margaret. 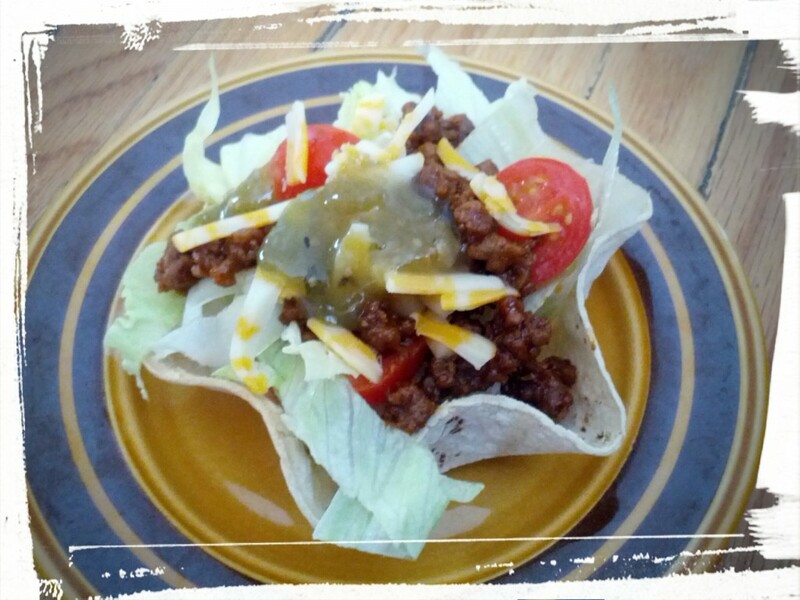 Salads I Have Known and Loved: Taco Salad — it’s what’s for lunch! Brown-bagging it never looked so good! As I mentioned before, I eat a lot of salad to help with my IBS issues, but salad can be boring. So I like to spice things up! In this case…literally! Want to make one yourself? Easy peasy! Heat the soy meat with the oil in a frying pan over medium heat. Add in the seasoning packet (or your own blend!) and a few tbsp. of water. Cook until meat is at your favoured consistency. Place tortillas in tortilla bowl shaper (or — KITCHEN HACK — on an upside-down muffin tray) and mold to shape of bowl. You can dampen them if you need to. Bake in a 400 degree oven until toasty. Remove and cool. 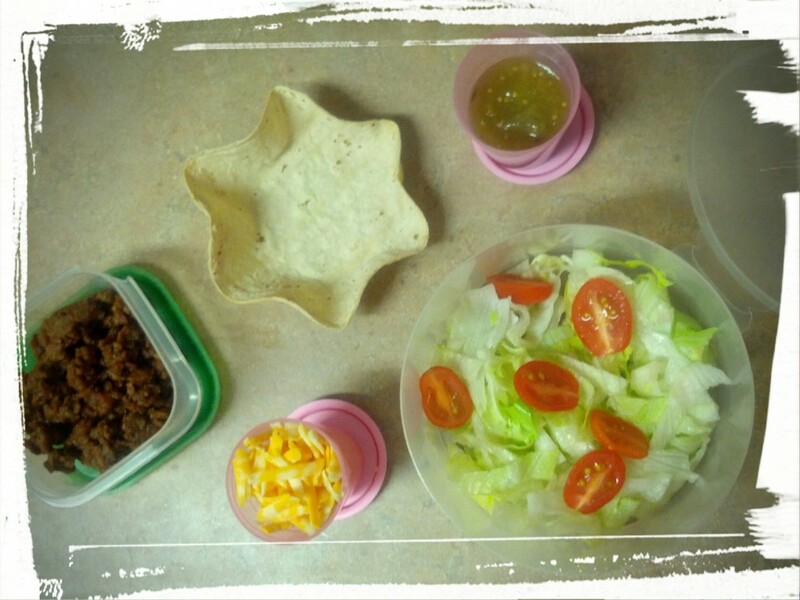 Assemble the lunch: pack tortilla bowl in a container, along with containers of cheese, lettuce, salsa, and seasoned meat. At lunch, assemble together and impress your co-workers! Also on the to-do list: eat and enjoy. I sent in a similar lunch with the DH and he enjoyed it. I like that I can make my own tortilla bowls from very plain and healthy tortillas, as opposed to buying ones that contain preservatives. Yay, health! Next Post: Maybe my lemon meringue tartlets. So cute, so tasty, so easy! Really, who knew? This entry was posted in Uncategorized on April 22, 2015 by Margaret. Baked and about to be eaten! Oh, sticky deliciousness! I saw a recipe for maple apple cinnamon buns a few months ago, and it inspired me to create this deliciously sticky brunch (or dessert!) recipe. It’s a quick bread, so there’s no waiting for the dough to rise, which means it’s actually pretty quick to put together and bake. And just like my pumpkin cinnamon buns, there’s corn starch in the dough, so they’re extra fluffy, which I like! The maple flavour is subtle but adds a nice note to the brown sugar flavour. My favourite bits are the crunchy sides. Mmm…buttery, crunchy, maple-y bites! 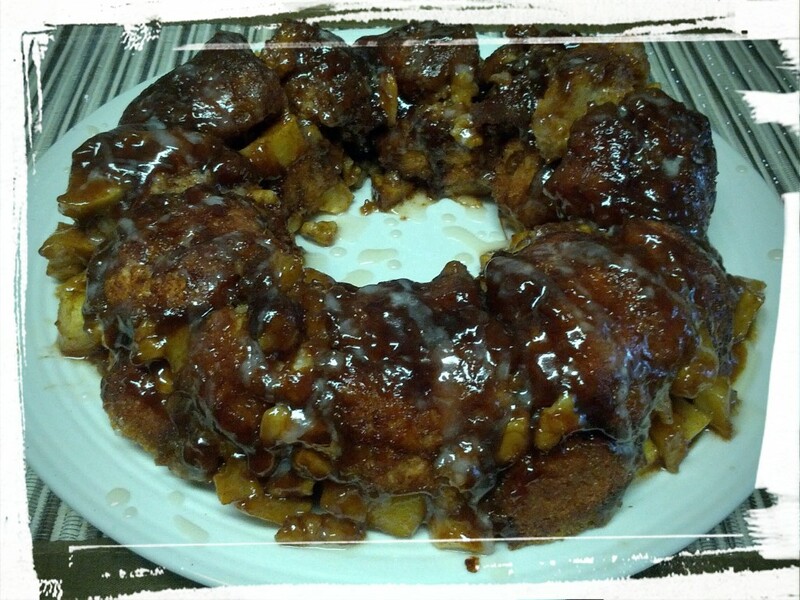 You can double the recipe to make a much more sizeable monkey bread, but you’d need to have a large family to eat it all! Or the metabolism of a racehorse. Neither of which I have. Mix the flour, baking powder, and salt together, and cut in the butter until it looks like peas. Mix in the milk, and set aside the dough. It’ll be lumpy and wet, but that’s ok! Mix the melted butter and maple syrup. Set aside. Mix the brown sugar, nutmeg, and cinnamon and set aside. Get a bundt pan and put it in your workspace. Roll the dough into little chunks, the size of Timbits (doughnut holes, for all you non-Canadians out there). Take each little ball of dough, and roll it in the butter/maple syrup mixture, and then in the cinnamon/brown sugar/nutmeg mixture. Place in the bundt pan. 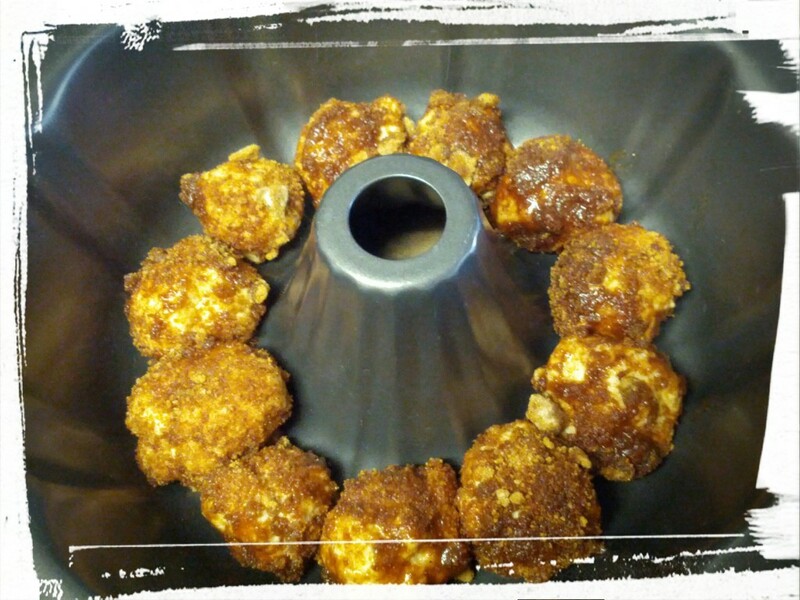 Repeat until you have a ring of little balls all around the base of the pan. Sprinkle half the walnuts and half the apple chunks over them. Repeat with remaining dough balls, and remaining walnuts and apples chunks. If there is any of the brown sugar mixture left, sprinkle that on the very top, and pour the remaining maple syrup and butter mixture over the very top. Bake in a 400 degree oven for half an hour, and then let sit for at least 15 minutes so that the syrup cools and holds the dish together. Loosen the edges of the bread, place a plate on top and invert. Remove the pan and voila, your fancy-looking dish is done! 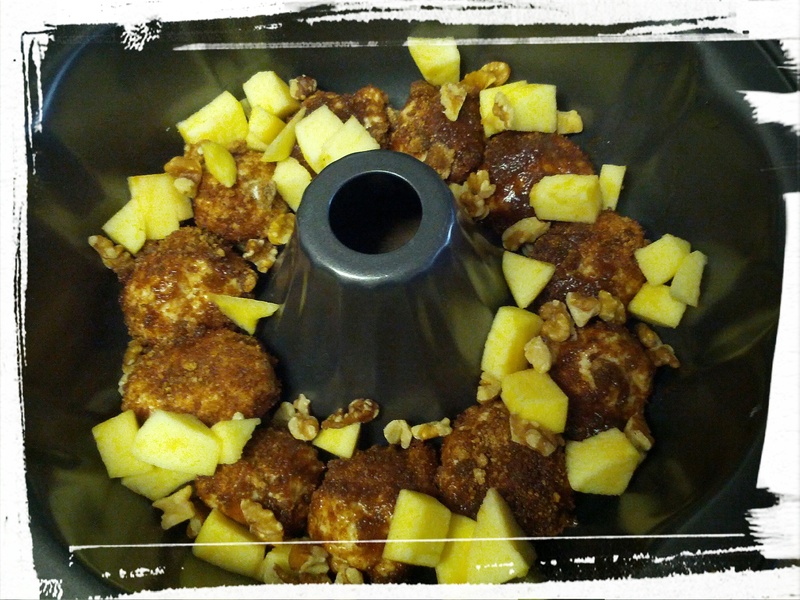 Monkey bread before baking. The nuts and apples make it healthy, yes? You can drizzle a simple glaze on top like I did, but it’s probably healthier not to. I just mixed up some icing sugar with a dash of milk and vanilla extract and drizzled it with a fork right on top of the warm monkey bread. 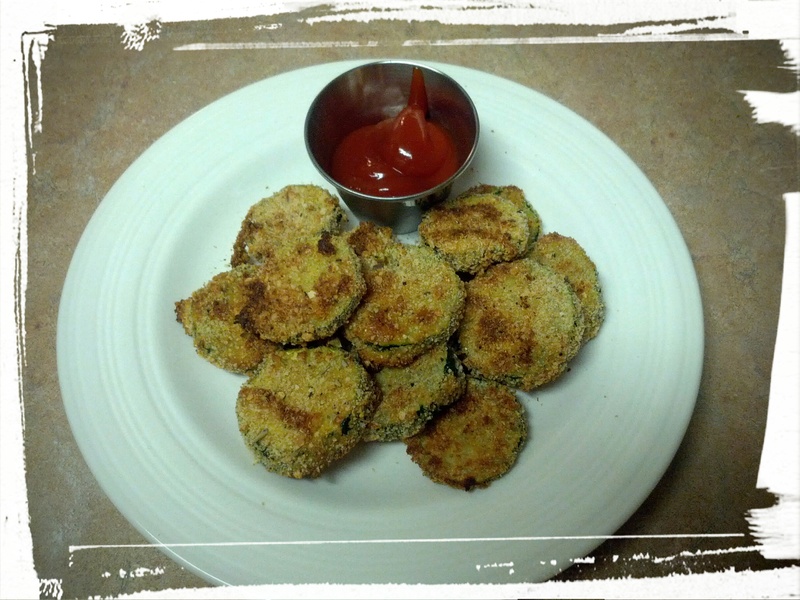 Next Post: Baked Zucchini Coins — a low-fat and tasty way to satisfy your French fry craving while eating green veggies. 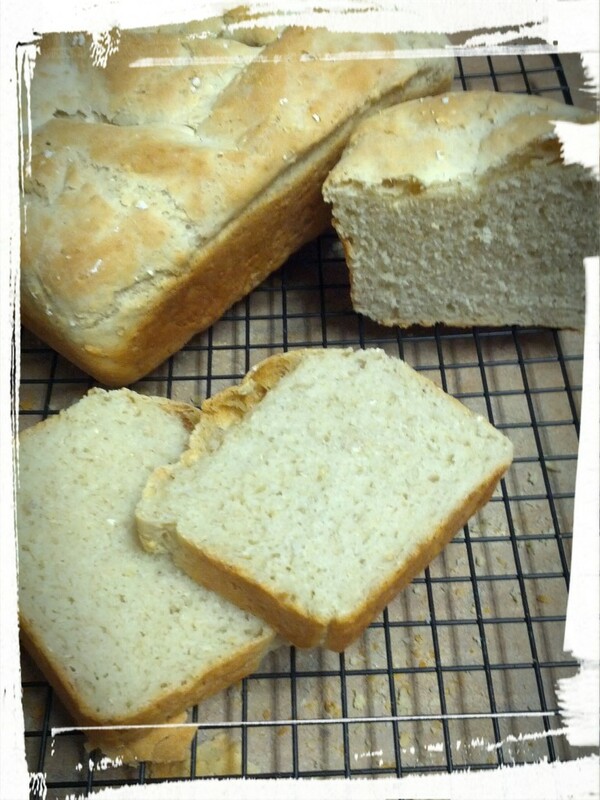 This entry was posted in Breakfast Foods, Desserts Not Otherwise Categorized, Quick Breads on April 18, 2015 by Margaret. 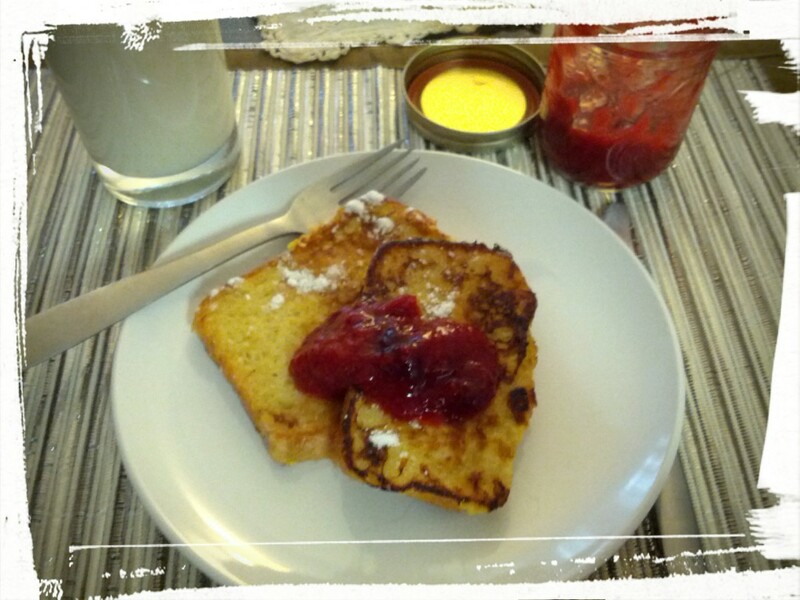 French toasted goodness, with homemade bread and homemade preserves! And milk. Does a body good! This week’s Memories of Meals Past: A few weeks ago, I woke up on the Friday of a long weekend and thought, huh…I feel like baking! So I baked a couple of loaves of bread. I tried out a new recipe (this one) and I’m glad I did! It’s an easy-peasy recipe for two loaves of bread, with minimal work. Officially, it’s a recipe for white bread, but me being me, I subbed in a cup of oats for one of the cups of flour. I wanted to add a bit more nutrition to a white bread recipe, and I didn’t have any whole wheat flour in the house, so oats it was. Turned out FABULOUS! Within 36 hours, the DH and I had demolished both loaves. It’s really easy to eat fresh bread! A few slices for breakfast with my homemade strawberry cranberry jam, a few slices with cheese for lunch, a few slices with dinner, a few slices for that midnight snack, and before you know it, a loaf and a half is gone. I woke up on the next day and realized there was only a half loaf left. And I tend to crave carbs on the weekend, so I made up some French toast using the remaining half loaf of bread. I’ve posted the recipe here, but it’s very basic, and easily customizable: mix an egg or two, a cup of milk, and a teaspoon of vanilla extract in a bowl. Slice the bread and soak the slices briefly on each side. Fry it up in a pan with lots of butter. Serve with homemade preserves and perhaps a dash of icing sugar. Demolish and wish there was more! French toast is great with homemade bread, but it’s almost as good with stale bread or bread with freezer burn. Waste not, want not, after all! See how nicely it slices? I totally recommend this recipe! Next Post: Lemon Meringue Tarts! Or, what to do with leftovers. 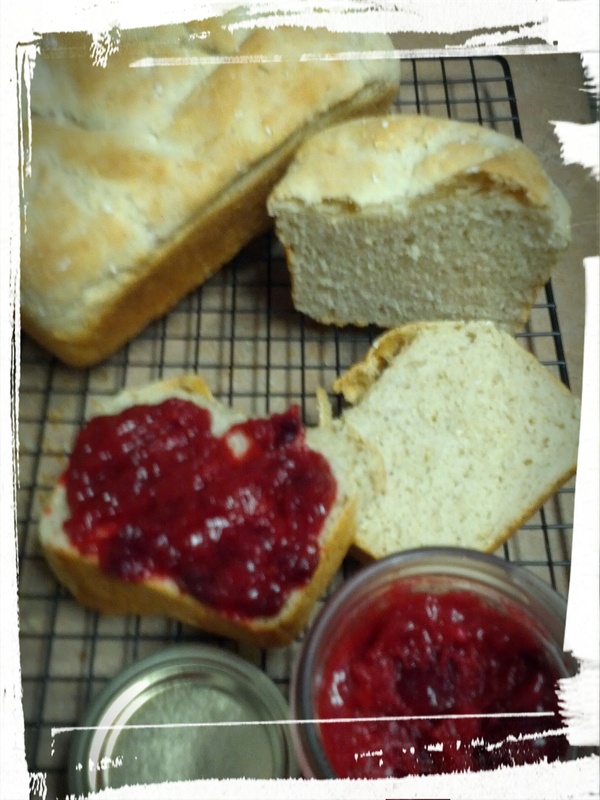 This entry was posted in Breakfast Foods, Memories of Meals Past, Quick Breads on April 18, 2015 by Margaret.